Today I found out how an Etch a Sketch works. An Etch a Sketch is a remarkably simple device. The primary components are just a small sheet of glass; a stylus controlled by two knobs; very fine aluminum powder; and tiny plastic beads. The tiny beads are mixed in with the powder to make sure the powder will continue to flow evenly and not get clumped together, as well as aid in the re-coating process when you shake the Etch a Sketch. Each knob is connected to either a horizontal or a vertical rail, which in turn is connected to a pulley system. This is all connected to the stylus via a very stiff wire. Among other things, aluminum powder has an interesting property in that it sticks to quite a lot of things, including glass, via an electrostatic charge. So by turning an Etch a Sketch upside down and shaking, you effectively coat the glass with a thin layer of aluminum powder, which then adheres to the glass fairly well. The stylus then simply scrapes off the aluminum powder from the glass wherever it’s touching. The lines this creates are black simply because there is no light inside the Etch a Sketch except what comes through the lines you’ve created. The Etch a Sketch was invented in the in 1950s in France by an electrician named André Cassagnes (note: not Arthur Granjean, which the vast majority of outlets state was the inventor for reasons stated below). Cassagnes also later became one of the world’s most famous kite inventors. Cassagnes began experimenting with trying to create a children’s drawing toy in the early 1950s and eventually came up with a decent enough concept to market. Together with Jerry Burger of the Ohio Art Company, the two eventually perfected the final design to look like a flat TV set and use a knob system for controlling the drawing. If you know much about the history of the Etch a Sketch, you might be saying “But wait, Arthur Granjean was actually the one who invented the Etch a Sketch! It says so on the patent.” It turns out, Arthur Granjean did not invent the Etch a Sketch, as the vast majority of informational outlets state. Cassagnes originally applied for the patent application for the drawing toy concept in 1957. That same year, he won a top prize at the Paris Concurs International D’Inventions for this concept and drawing. Unfortunately for him, he did not have the money to ultimately register his patent ($200 U.S.). He eventually acquired an investor by the name of Paul Chaze to be able to do this. Chaze’s accountant Arthur Granjean filed the patent, which is why it is under his name and why most places state that he was the inventor. Granjean then assigned the French patent rights to Paul Chaze so Chaze could market it. In 1965, despite the Etch a Sketch’s extreme popularity, Chaze somehow convinced Cassagnes to relinquish all rights to the Etch a Sketch, except for sales in France, for a mere $10,000. This was a fraction of the annual royalties paid to Chaze which added to about $60,000 a year in the United States alone. While Granjean had no part whatsoever in inventing the Etch a Sketch, he did give the device the name “L’Ecran Magique” (The Magic Glass). Cassagnes’ name for it had been the “Telecran”, which is still what the Etch a Sketch is called in France today. Eventually, the Ohio Art Company purchased the rights to The Magic Screen for United States distribution for $25,000 from Chaze. They initially saw it at an International Toy Fair in Nuremburg, Germany, but rejected the idea. It wasn’t until much later through a variety of connections, that the Ohio company was personally presented the idea again and this time decided to buy it. They renamed it the Etch a Sketch and launched an advertising campaign just before Christmas of 1960. It was an instant hit and within a few years it became one of the most popular toys in the world. 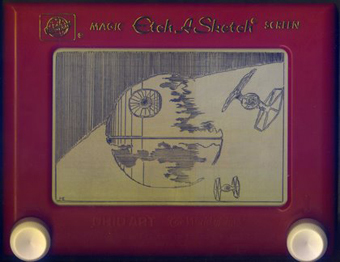 The Etch a Sketch was one of the first ever toys advertised on TV. To date, there have been approximately 150 million Etch a Sketch’s sold in the United States alone since its creation about 50 years ago. When artists are finished with a drawing on the Etch a Sketch that they’d like to make permanent, they typically will drill small holes in the bottom back of the Etch a Sketch and remove the excess aluminum powder and plastic beads to make it more shake resistant. Aluminum powder is extremely flammable and the sale of it is often restricted in many countries. Besides being used in Etch a Sketches, it used to be very commonly used to create bright flashes for taking pictures. Now-a-days, it’s primarily used as one of the base “ingredients” in various types of fireworks.